Question for the BeOS old timers: What was VoteNow? Question for the older BeOS fans here that may know! I was looking through the preflets in Dan0 for inspiration, and noticed a screensaver I can’t believe I never saw before until now, which is labelled VoteNow. And oddly enough (and maybe it’s why I never noticed), the usual “Buy Now” of course is still in the screensaver set, still flashing it’s usual message, (and I had read the history of ‘Buy Now’), but what was Vote Now? It flashes “Vote Now” in the same fashion as “Buy Now”. Was this related to a decision for BeIA? Was it to save the company? Was it just a joke? Was it for US elections? Why was it there and in the ‘public service message’ screensaver as ‘a friendly reminder’? Every piece in every OS has an anecdote behind it usually (like Sosumi on the Mac), so I’d Be (pun intended) interested in finding out more about it from those who may know. It was probably created around or just before November on an even numbered year. Just a guess. Would be great to make the Dano theme a 2nd configurable option for Haiku. why was it made? Probrbly a joke, but the users were never in on it. Dano not Dan0. The 0 was not part of the code name. Genki (BeOS R4.5) was labelled “genki0” in the about box, version info on some exes and a few command line places. Maui (BeOS R5.0) was labelled “maui0” as above. 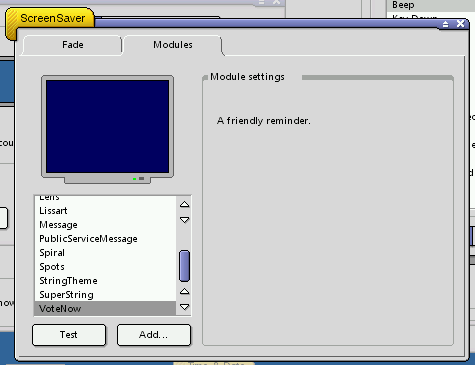 Dano (BeOS R5.1 leaked build) was labelled “dano0” as above. The R5 code names come from “Hawaii 5-0”, by the way.